At Houston Furniture Bank, we are truly inspired by our clients. They are hopeful and hardworking individuals who have fought long and hard to achieve stability. 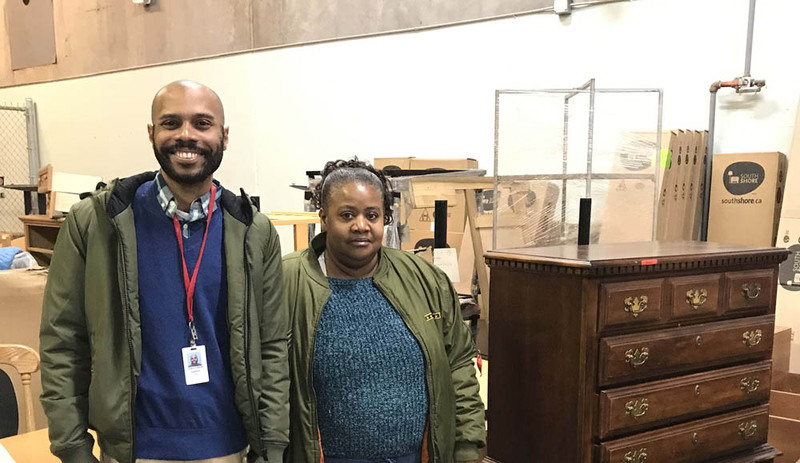 Rachel Thomas is a heartwarming example of the clients who come in through our Furniture Distribution Center, and she has generously agreed to share her story with us. Rachel and her sons traded in the leaks and cracks for a clean and well-maintained apartment with a working stove and refrigerator. This was a vast improvement, but there was still no furniture! Caseworker Chris spoke passionately about his admiration for Rachel and the way she “budgets her money the best she can,” prioritizing the “basic needs of her family.” Chris also has observed that Rachel is a devoted caregiver of her disabled, 29-year-old son. Rachel in turn gave all the credit to Chris and to her nineteen-year-old son who works three jobs to help support the family, all while attending the high school from which he will soon graduate. Our clients make a tremendous effort to arrive at 8220 Mosley Road. Rachel had planned to take several busses to visit us, but on the morning of her visit, heavy rain was forecast with the possibility of flash flooding. Not wanting to miss her appointment, Rachel was able to find a neighbor who was willing to provide her with a ride. He waited patiently in our waiting room while Rachel selected her furniture and made time for this interview. Once in our Furniture Distribution Center, Rachel selected the essential furniture her family needed to make her empty house a home. Rachel was excited about taking home twin beds for her sons and dressers in which all three can organize their clothing. At Houston Furniture Bank we are so happy that we could help Rachel and her family. We could not have done it without the support of our donors or the help of Christopher Harper, The Harris Center, and Rachel’s supportive neighbor.